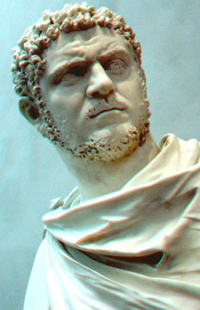 Caracalla was born Lucius Septimius Bassianus on April, 4th 188. He was the elder of two sons born to the Emperor Septimius Severus and his wife Julia Domna. 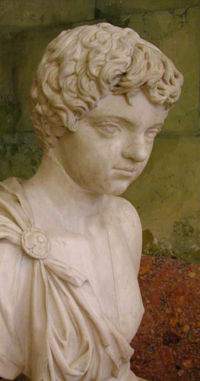 At the age of 8, he was given the name Marcus Aurelius Antoninus in order to draw a connection to the fondly remembered Antonines. Caracalla was not his name, it was a style of cloak popularized by the emperor. He was never addressed as Caracalla although the name is most commonly used now to refer to this emperor. Caracalla was given the title of Augustus when he was 10. Although just a boy and wielding no real power, as he grew older he would become something like a junior partner to his father. Most importantly this title designated Caracalla as his fathers heir. His brother Geta, who was younger than him buy just a year, was given the lesser title of Caesar. The favor showed one son over the other was just one of a number issues that fueled resentment, disdain, and a life long bitter rivalry between the two brothers. The rivalry turned to animosity and antagonism. The brothers would oppose each other on almost every issue out of spite. The private rivalry soon began to transform into a public spectacle. This threatened to ruin their fathers carefully fostered image of a serene imperial family who worked together in harmony. 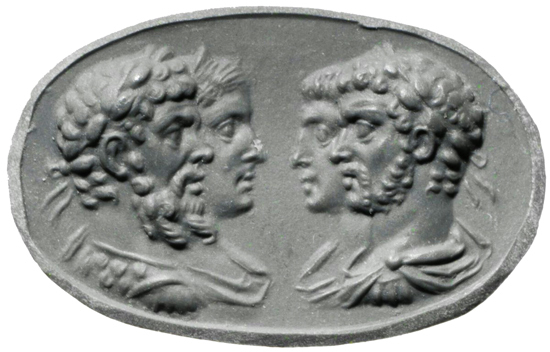 "if the one attached himself to a certain faction, the other would be sure to choose the opposite side...Severus, seeing that his sons were changing their mode of life and that the legions were becoming enervated by idleness, made a campaign against the Britons"
"Antoninus was causing him alarm and endless anxiety by his intemperate life, by his evident intention to murder his brother if the chance should offer, and, finally, by plotting against the emperor himself." 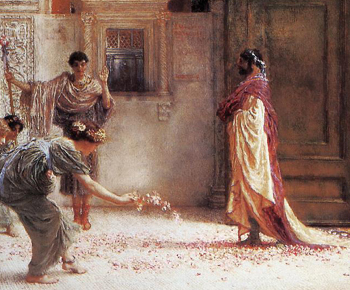 Dio accounts an attempt Caracalla may have made on his father life, one that he did not follow through with. Although the validity of this story is in question, the fact that Caracalla's power and influence had become almost as great as his fathers and he was known to be quite ambitious is not. It is not an unreasonable claim, from what we know concerning Caracalla, to say he was not above killing anyone who might perceived as an obstacle or a threat. Much of the imperial court traveled with the Emperor and his sons to Britain in 208. Caracalla supported his father in his military campaigns, Geta was given civilian authority and took a more administrative role. 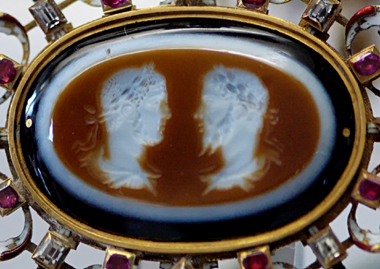 Septimius Severus elevated Geta to Augustus in 209, effectively making him co-ruler with himself and Caracalla. He was possibly looking to appease his younger son and ease the tension between the two brothers. Instead the rivalry only intensified. There is no doubt this move threatened Caracalla and probably emboldened Geta. Besides the general disdain each had for the other which drove them to plot the others demise, Caracalla would never share power with his younger brother as an equal. Geta had no intention of taking the role of junior partner. He would not voluntarily take a lesser role to his brother as Lucius Verus did with his brother Marcus Aurelius a half century earlier. Severus fell ill and died on February 4, 211 in York. He is said to have made one last plea to his sons to make peace but his pleas fell on deaf ears. Two brothers at odds with each other would now be expected to peacefully co-exist as joint emperors. Caracalla was 22, Geta was 21. The two brothers returned to Rome and immediately began to oppose the other on almost every issue. Government was crippled and people were forced to chose sides. It quickly became a bitter and bloody struggle between the two factions. "The two pretended to love and commend each other, but in all that they did they were diametrically opposed, and anyone could see that something terrible was bound to result from the situation. This was foreseen even before they reached Rome." Although Severus shared the title of Augustus with his sons, there was little question that he retained most of the power. He used his influence to keep his two son in line as best he could. Without their fathers controlling influence, the brothers were free to finally settle their differences once and for all. This long sibling rivalry would come to an end just 11 months after their fathers death. 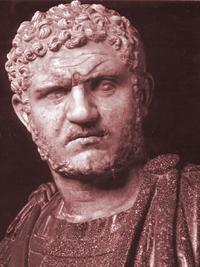 After at least one failed attempt to take his brothers life, Caracalla had Geta killed some time in late December of 211. He was 22 years old at the time of his death. "Antoninus wished to murder his brother at the Saturnalia, but was unable to do so; ... and so there now ensued many sharp encounters between the two, each of whom felt that the other was plotting against him, and many defensive measures were taken on both sides. Since many soldiers and athletes, therefore, were guarding Geta, both abroad and at home, day and night alike, Antoninus induced his mother to summon them both, unattended, to her apartment, with a view to reconciling them. Thus Geta was persuaded, and went in with him; but when they were inside, some centurions, previously instructed by Antoninus, rushed in a body and struck down Geta, who at sight of them had run to his mother, hung about her neck and clung to her bosom and breasts, lamenting and crying: "Mother that didst bear me, mother that didst bear me, help! I am being murdered." And so she, tricked in this way, saw her son perishing in the most impious fashion in her arms, and received him at his death into the very womb, as it were, whence he had been born; for she was all covered with his blood, so that she took no note of the wound she had received on her hand." Caracalla managed to either purge, exile, intimidate, or pay off all those who still stood in his way. To the senate he justified his actions as self defense. He lamented that he had been the victim of a plot and his life was in danger. He simply murdered his brother before his brother could murder him. He also took quick steps to pacify the legions offering them rewards for their loyalty. "Immediately after the murder of Geta, Caracalla hurried from the Palace to the Praetorian Camp, where he declared that Geta had made a plot against him. He then promised the soldiers a donative"
In some ways Caracalla showed himself as a reformer and competent ruler. He Granted citizenship to all free inhabitants of the empire, raised the pay of soldiers, and began construction on the bathhouses that bear his name. In other ways he was seen as a brutal tyrant. Along with a bloody purge of his brothers supporters, he dealt harshly with those he identified as enemies either foreign or domestic. As the people of Alexandria discovered, he was capable of reacting to insult, disloyalty, and mockery (either real or imagined) with shocking cruelty. Upon hearing that the people of Alexandria were in the habit of speaking ill of him, mocking him for various reasons, not the least of which was the murder of his brother, he set out to teach the inhabitants of that city a lesson in 215. "He set out for Alexandria, concealing his wrath and pretending that he longed to see them. So when he reached the suburbs, whither the leading citizens had come ... he first greeted them cordially, even making him his guests at a banquet, and then put them to death." "he slaughtered so many persons that he did not even venture to say anything about their number, but wrote to the senate that it was of no interest how many of them or who had died, since all had deserved to suffer this fate." He seemed to be content to rule by force and fear, he did not need the love of the people if he had the loyalty of the military. He succeeded at this by heeding the advice of his father who stressed the importance of being ever mindful of the troops. He who had the loyalty of the military can enforce his will. He ensured their loyalty with praise, high pay and generous benefits. He often took steps to make it appear that he was one of them, just another soldier in the service of Rome. "he would march with the soldiers and run with them, neither bathing nor changing his clothing, but helping them in every task and choosing exactly the same food as they had; and he would often send to the enemy's leaders and challenge them to single combat." "I know that my behavior does not please you; but that is the very reason that I have arms and soldiers, so that I may disregard what is said about me"
There were few military actions of any significance during his reign. He engaged the German Alamani with some success leading to an agreement of peace with many of those tribes. He sought to engage the Parthians but it amounted to little more than harassment for minor gains. By 217 Caracalla was preparing for renewed conflict with the Persians when he was murdered by his beloved troops who had been plotting his death for various grievances. All the favor he showed the military, in the end, could not negate the animosity that inevitably grows from the cruel behavior of a tyrant. While the emperor was traveling from Edessa to Carrhae, he stopped to rest and was stabbed by a soldier who had approached him as if he had important news to impart. Cassius Dio identifies the soldier as "Martialis" who fled the scene but was quickly captured and killed by the emperors personal guard. He stated that while the guard chased after the assailant "the tribunes, pretending to come to his (Caracalla) rescue, slew him." "absolutely everybody, both senators and the rest of the population, men and women alike, hated him most violently"